When I was an undergraduate, I spent a Fall Semester studying abroad in South East Asia. It was an AMAZING two months scouting around Vietnam, Thailand, Laos, and Cambodia with a dynamic group of individuals. One of the amazing locations that we went was Halong Bay Vietnam, which is a UNESCO Heritage site. This area is known for its limestone columns coming up out of the water. There are 1,600 columns, forming islands, coming out of the phosphorescent bay. There are a lot of arches, caves, and other things to explore. This area was under water, and due to tectonic uplift, the towers came popping out. These towers, with the super colorful turquoise and green waters offer ample colors and opportunities for pastel arts. I love the sunrise and silhouettes that they create. Deep, navy blues, and blacks with a pink sky. Since my camera stopped working, I would like to thank Jenn Feasby, one of my travel companions, for posting her photos for us to remember our trip. She is an amazing photographer (I am pretty sure she was published to National Geographic). I used her photo as inspiration and guidance, though her photos had a lot more navy, and I wanted more pre dawn purple in my chalk painting. I took a little bit of licence with the colors, and designs. 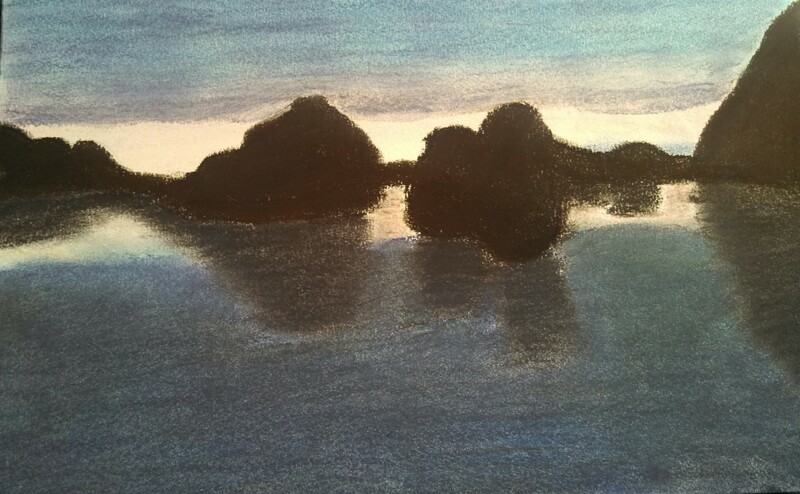 This pastel sketch was my first experience with silhouettes, and reminds me of all of the good times spent with the Pacific Discovery Corps. This is the first picture that I did on professional grade paper. It is an 11 x 15 landscape portrait done with pastels. It took several hours to try and do the chalk sketching and renderings.